I reflect on writing over 1400 detailed reviews, one for every book I’ve read since joining Goodreads 10 years ago. Back in May 2008 I joined a little website called Goodreads, then privately-owned and managed, which wanted to be the next big social media platform for readers. At first I just played around with the site, rating some books I'd previously read, and keeping track of what I was reading now. I'd write the odd review. 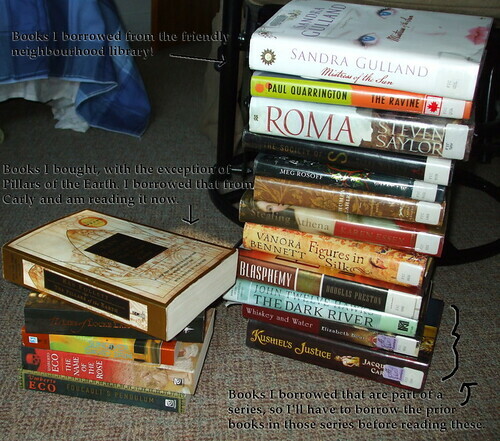 Sometime later that year, probably around August or September, I began to review every book I read. And now I’ve been doing that for a whole decade. Of course, that’s next year’s anniversary. Tonight, though, as I posted yet another book review to Goodreads, I realized I missed another arbitrary base-ten milestone anniversary. For the past five years, I have written (and shared) a review of every book I’ve read. Last Thursday my Twitter feed erupted with people talking about Amazon buying Goodreads. As I read the first few, sporadic tweets, I blinked incredulously. Was I reading that right? I scrolled down and saw that I had missed a tweet from the official Goodreads account making the announcement. I followed some links and landed in the feedback forum’s official announcement topic. Two days and more than 800 posts later, a particularly vocal portion of the Goodreads member base has voiced its concern and disappointment over this turn of events. There has been quite a bit of rage-quitting and table-flipping in the past few days. The year is almost over, and unless I finish a book tomorrow, it looks like I will end 2011 with 115 books read. Not too shabby, I suppose. Far cry from my goal, which was to tie with 2009’s best of 156 books. But still pretty good, all things considered. Indeed, from time to time people exclaim their awe at how much I read. I don’t like to draw too much attention to the quantity, which is after all no indicator of quality, because it feels too much like bragging. But today someone on Goodreads asked me how I manage to read so much, and as I was composing my reply, I realized it was getting too lengthy. Lengthy enough for a blog post, in fact. It’s quite simple. I have a time machine, you see, and that allows me to go back in time and spend more time reading throughout the day…. Well, I wish that weren’t so much science fiction! Literacy is wonderful. I love reading. I spent most of this summer reading Terry Goodkind's Sword of Truth series, fed to me by my coworker. So I went to the library for the first time this summer last week and got out the books you see in the stack on the right. Three of those books are the second or fifth book in a series, however, so I'll need to read the other books in those series before I can begin reading them. Naturally I made a list of books I wanted to get at the library. However, I forgot the list at home, and I ended up not needing it anyway, because I pretty much took home the New Books shelf, as I often do.